Amazon.com Price: $61.00 $52.90 (as of 20/04/2019 23:25 PST- Details)	& FREE Shipping. 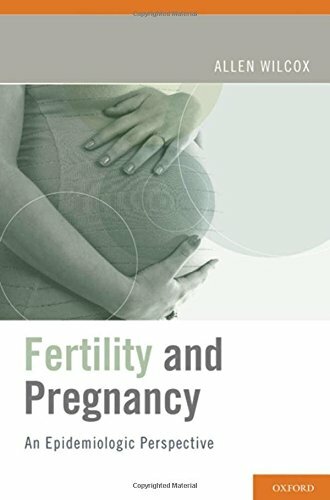 Fertility and Pregnancy: An Epidemiologic Perspective, is a lively overview of human reproduction: how it works, and what causes it to go wrong. 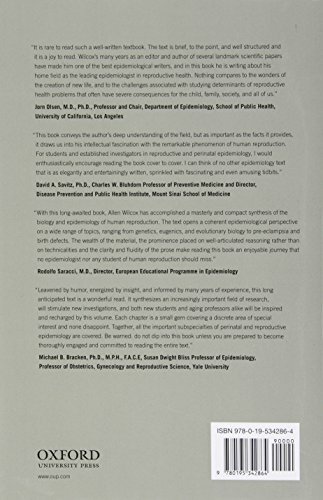 Weaving together history, biology, obstetrics, pediatrics, demography, infectious diseases, molecular genetics, and evolutionary biology, Allen Wilcox brings a fresh coherence to the epidemiologic study of reproduction and pregnancy. Along the way, he provides entertaining anecdotes, superb graphs, odd tidbits and occasional humor that bring the topic to life. The book is divided into two sections. The first lays the foundations – the basic principles of reproductive physiology, demography, infectious diseases, and genetics as they apply to human reproduction. The second part deals with the endpoints of reproductive epidemiology – a spectrum ranging from infertility and fetal loss to birth defects and the delayed effects of fetal exposures. The book closes with a discussion of unsolved problems, suggesting possible research projects for a new generation of epidemiologists. An extensive glossary makes this a valuable reference as well as an enjoyable read.